As part of the Office365 Summit we’re getting lots of great information about the upcoming Skype for Business release. 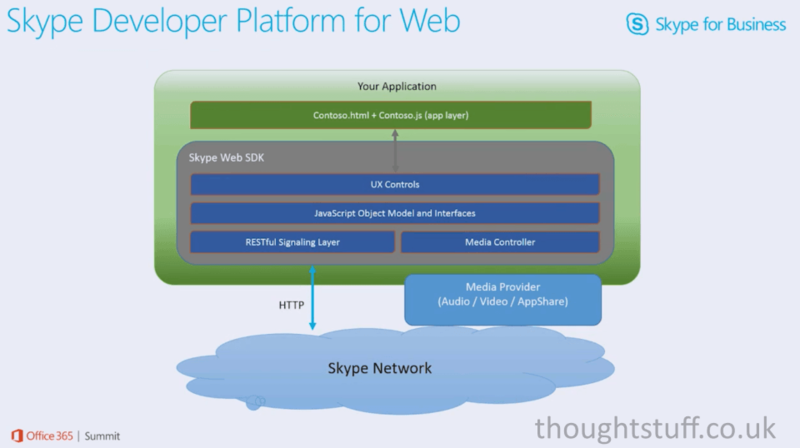 In a video – Opportunities with the Skype Developer Platform – Daniel Jonathan Valik, Sr. Technical Product Marketing Manager and Srividhya Chandrasekaran, Sr. 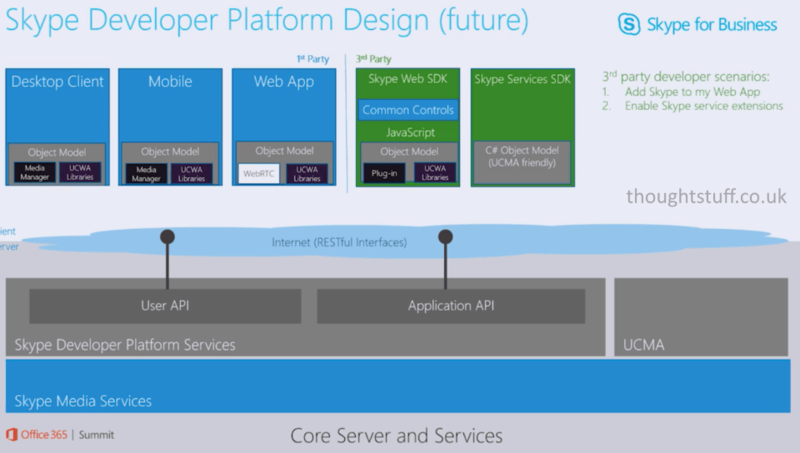 Program Manager, talk through what we can expect to see in the new Skype Developer Platform. Platform Neutral – works for iOS, Windows Android, Emulated etc. This API stack is the same stack which is being used to power the Skype for Business 1st party applications (the clients, Web Access etc) – doing this shows the commitment from the team to ensuring the API stays up to date and relevant over time. What’s worth mentioning here is that UCMA is still not supported in Skype for Business Online, and at launch the Skype Web SDK will not be supported Online. 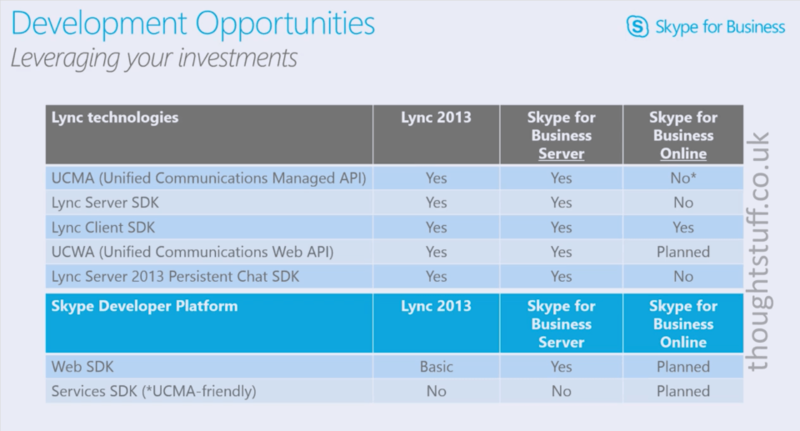 Also, only Basic support for the Web SDK will be available in Lync 2013. I don’t know what that means exactly, but when I find out I’ll let you know! I’ll say it again, because it’s going to come up in a lot of conversations in the next few months: at launch, the new Skype for Web API will not work with Skype for Business Online. This lack of support is a shame. I’m hoping that it’s just something which couldn’t get worked out in time for the April launch date, and that it just requires an update to the Online codebase which has to be scheduled in, tested and rolled out. Regardless, there will a lot of companies who have moved from on-premises to Online (in no small part because Microsoft have been pushing customers to the cloud) and who will want to make use of the new SDK everyone is talking about. UCWA is still not supported on Lync Online, which is a pain for some but perhaps not a major roadblock. However, Microsoft are pushing this Web-based approach of communication much more aggressively now, Lync Server SDK is a big part of that, and so they really need to ensure that all their customers can use it equally. 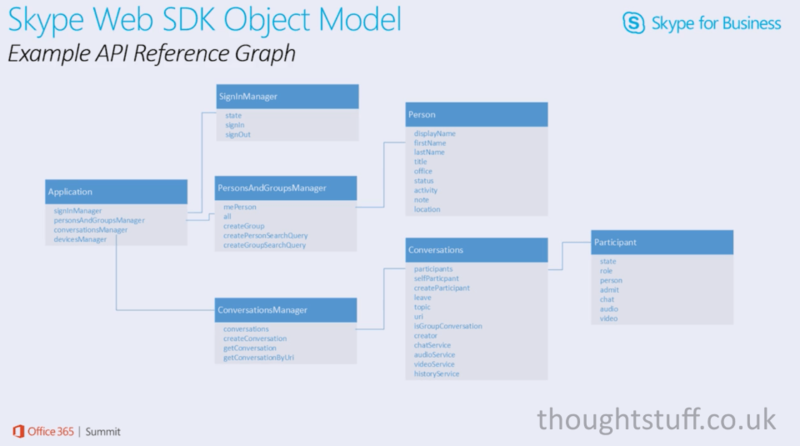 Here’s a sneak-peak at the Skype Web SDK object model, which shows the sort of data you’ll be able to access, and the relationships between different objects. Of particular note within the Conversations object are audioService and videoService – I look forward to playing with those! What is the best way to communicate with the Web SDK on android?